Steel Strap Tools – Grant Packaging, LLC. 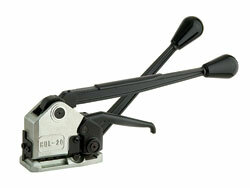 It’s possible to find steel strapping tools at prices far lower than are typically advertised. Grant Packaging, a strap and tools supplier that supplies businesses throughout Kansas, Missouri, Illinois, Arkansas, Iowa and Indiana, offers strapping tools made by some of the best brands in the industry, and the company offers them for less. A complete resource for strapping companies, Grant Packaging’s selection can be quickly assessed 24/7 on the Internet, and ordering is as easy as calling their toll-free number. When you browse the tool selection at www.GrantPackagingLLC.com, you’ll see one-handed tools, two-handed tools for high-tensile products, sealless tools and more. You’ll also notice that the company offers new tools at very competitive prices, as well as refurbished tools with six-month warranties and new parts. Grant Packaging also has a loaner tool program for its strap clients, which is a real and valuable benefit to companies trying new strap or just getting started. When you’re ready to order or if you simply have questions about product, tools or service, call 866-GRANT-PAC or email info@grantpackagingllc.com. The company prides itself on customer service and prompt order fulfillment. You can get what you need, when you need it, for less!